← MYOG Challenge: Cuben Fiber Pack! 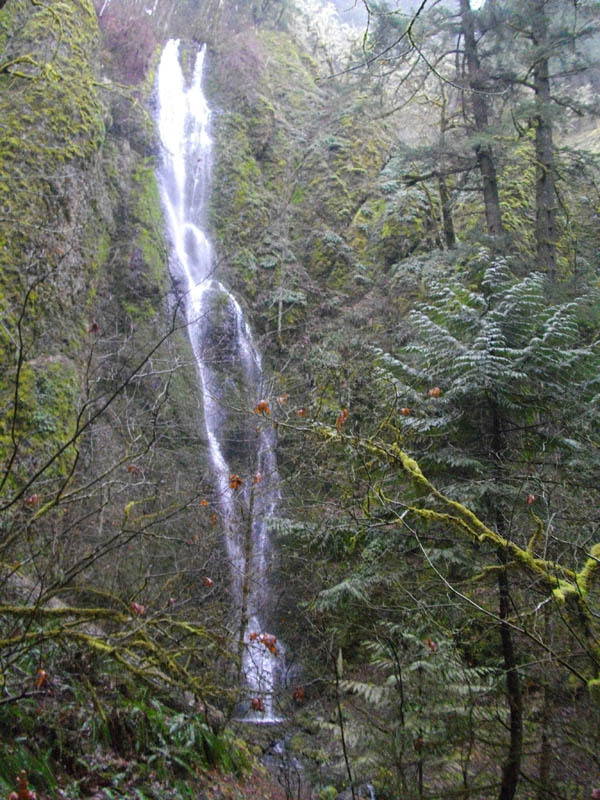 Bagged my January training hike in the Gorge today. Mola Ram sula ram! The weather has been absolutely killer – unless you’re a skier, snowboarder, snowshoe’r, run a ski resort, work for a ski resort, are a snowman, yeti, meteorologist, dam administrator, farmer, fisherman, fish, tree or user of electricity – so I took advantage to head up Herman Creek for a training hike. I was tempted to abuse myself on the Rickely Rickrollerly Ruckel Creek trail but Ploss helped steer me towards something that wouldn’t be so… demoralizing. The Heeunk Ruckel trail is gorn freaking steep! 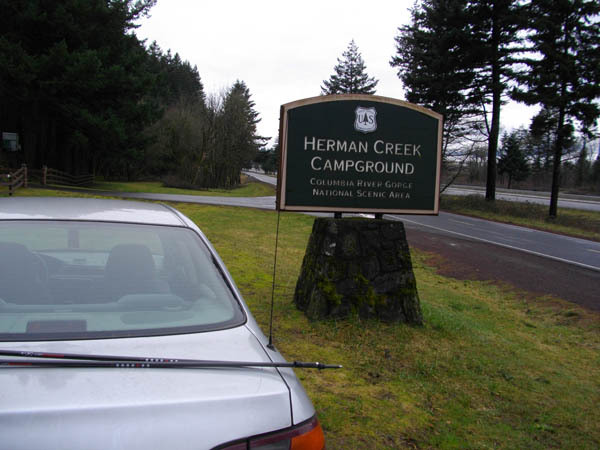 Getting to Herman Creek Campground is easy, westbound on I-84; the road up to the campground remains closed this time of year however, so I had to walk an additional .3 miles to the trailhead. My (turnaround) destination was Casey Creek camp, about 4.2 miles from the road and 3.8 miles from the trailhead. From here 8 switchbacks await you over the first mile, gaining about 700′, which includes crossing a jeep track/fire road about 1/2 mile up, then generally levels off to begin a long, steady ascent. Note: the jeep track sports an extraneous Trail 406 junction sign. Continue forward to the second/upper Trail 406 sign and trail. You’ll have 4 opportunities from the campground onwards to head NE to the Nick Eaton ridge on spurs I’m looking forward to exploring on future hikes. The third source is Camp Creek, .5 miles from the falls and 2.5 miles from the trailhead, and today it was really swollen – so much so it required a minor ford. Not Rich Ford. Nor Rich Guy. But I digress. My boots worked it and my feet stayed relatively dry. 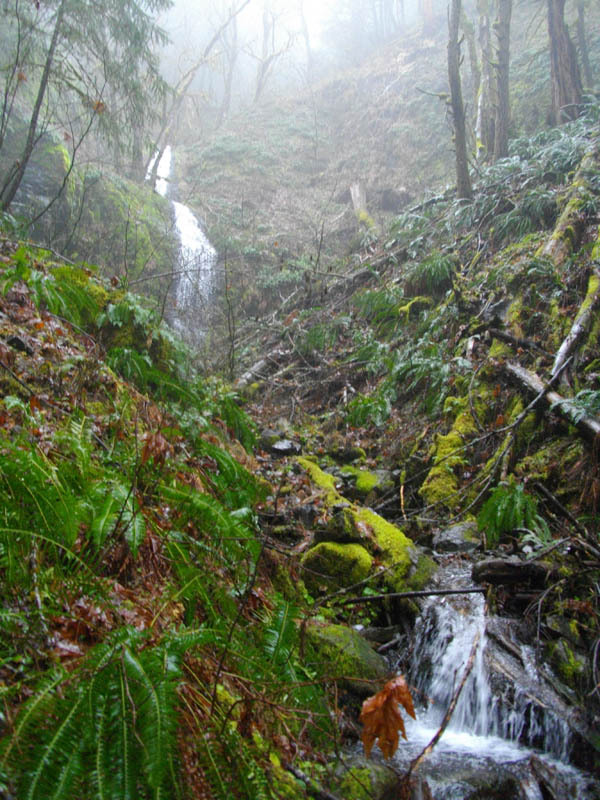 The fourth & last source is about .5 miles from Camp Creek – picking up the pattern here? – and is another beautiful water cascade and a great place to fill up. A really great place. 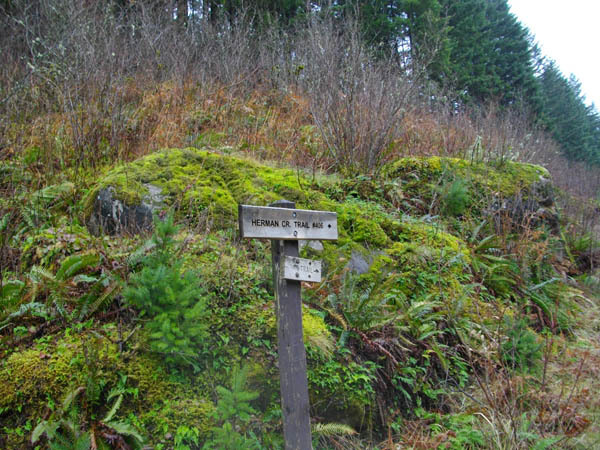 You are almost exactly .9 miles from Casey Creek camp here, and if your destination is said camp, your best options for water are, well, here; a mile past Casey Creek camp at Hazel Creek; or down Trail 407, aka The Fail Trail. Do yourself a favor and fill up at this last source to your heart’s desire; the blogger will consider throwing an extra platy in his pack next time for this purpose only vs. a trip down Trail 407. I reached my destination almost exactly at my hard turnaround time, and my spirits were high. Spirits only. Elevation per my Tech4o: 1545′. The trail was in fantastic condition – only 1 blowdown and it was really simple to cross. 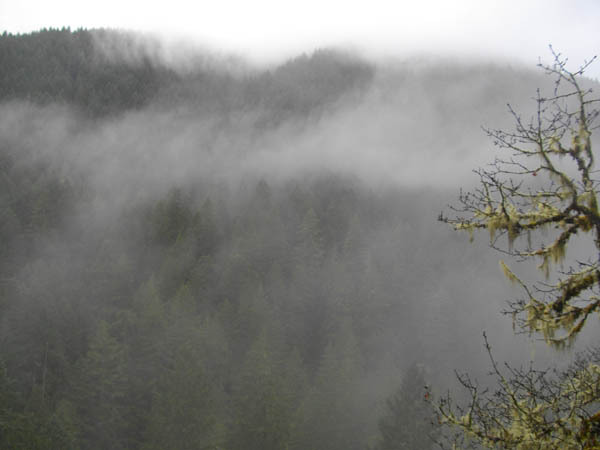 No snow, nor any visible snow even across the Herman Creek gorge to the hilltops on the PCT, Tomlike Mountain etc. 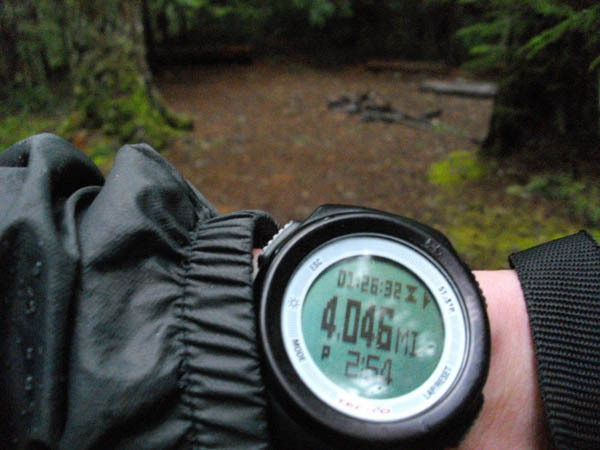 The first half- to full mile of any hike remains a real mental struggle for me; physically it takes about that long for me to get warmed up typically, during which I really battle to stay mentally tough and embrace what I’m doing. After that I’m usually golden, but it’s something I continue to be aware of, and work to defeat. GoLite Virga jacket worked it – was not overly sweaty, was protected from the several downpours I experienced, and was generally warm and comfortable in 40° January weather. BPL Stix are awesome. This was a perfect terrain test for their versatility, and the best endorsement I can give them is that I was almost unaware of them: they simply behaved as an extension of my movement. Will be employing the Ploss Mod. Spaced filing my toenails down to the skin, leading to Boot Toenail Fail. Will be a pretty good backpacker for a guy with 9 toenails in about a week. Ran into a single dude, training for the PCT – Mexico to Canada baby 🙂 He’s looking to see us @ Rainier in September. Big props. Said dude gave me an excellent idea for my next training hike: Herman Creek to PCT. Ploss will remember this as the 4000′ descent from Benson Plateau over about 6.5 miles. Who needs the Gorn Ruckel Creek? I made excellent time. Excellent photography? Not so much. This entry was posted in Columbia River Gorge, Training. Bookmark the permalink. Nicely done and blogged, my friend. Big props on the result and hopes that you can continue to do this through the winter given your regular commutes to the Hood. Like the photo of Casey Creek CG. It looks about the same as when we left it last September. Do you remember? It was nearly the 21st night of September . . .. There are other “photos” of CCC that I can show y’all tonight…cameraman fail 😉 It was otherwise exactly the same – I might have kicked it on my tree/chair if it wasn’t a total soaker!